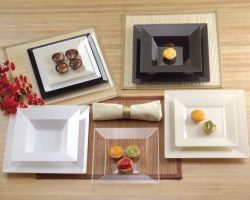 This popular line features square plastic plates and glasses made of extra heavyweight plastic with a high gloss, polished finish. Specially designed wide and deep edges protect against food spillage and offer optimum elegance. Designed to be disposable, these plates when cared for can be reused for residential use making the dinnerware and glassware ultra-affordable.